The Home & Student version of Microsoft Office targets the home and education markets, covering the four applications most used outside the workplace: Word, Excel, PowerPoint, and OneNote. The minibooks in this essential All-in-One guide include real-world examples and projects that cover the new features and capabilities of Office 2013. Straightforward advice and beneficial projects help you to learn the basics of creating a resume in Word, establishing a home budget in Excel, developing a dynamic school presentation with PowerPoint, and taking notes in OneNote. 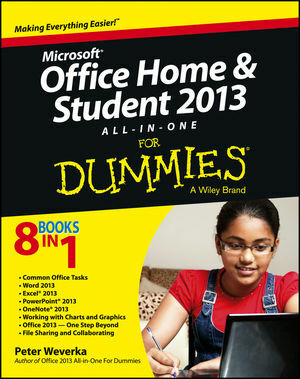 Office Home & Student 2013 All-in-One For Dummies is an easy-to-understand guide to the essentials of Office 2013! Peter Weverka is a veteran For Dummies author who has written about a wide variety of applications. Along with two bestselling editions of Office All-in-One For Dummies, Peter has written PowerPoint All-in-One For Dummies and Microsoft Money For Dummies.